← Go Ahead, Stretch Yourself! 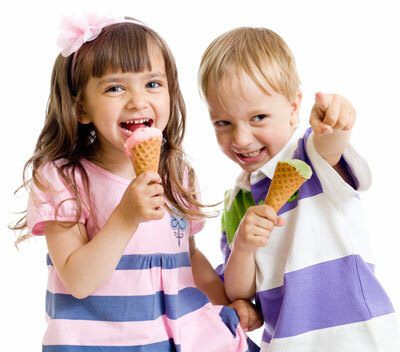 Ice cream has been around since Marco Polo brought it to Europe from China. Ice cream has a special place in Canadian lore, ever since Anne of Green Gables (the heroine of Lucy Maud Montgomery’s famed novels) dreamt about tasting it for the very first time. No birthday party is complete without cake and ice cream. And this Father’s Day, many of us have memories of going out for ice cream with our fathers, especially on long, hot summer evenings. With varied diets and preferences, no one needs to go without ice cream. Just look at the varieties you find right here in Toronto. Hard Ice Cream – Traditional or regular ice cream is made with cream and/or milk, sugar, flavouring and may contain eggs. Richness depends on the cream content. A variation is French Ice Cream, made with a custard base with egg yolks or whole eggs. Traditional ice cream can come in light or reduced fat varieties, meaning a lower level of milk fat. This makes the ice cream less expensive and much less rich tasting. Soft Ice Cream – Many of us grew up on “Dairy Queen’s” soft ice cream, sometimes dipped in chocolate! Soft ice cream has the same ingredients as the traditional but it is frozen at a higher temperature in a special machine that keeps the mixture smooth and soft. Soft ice cream may taste light, but it has the same calories. Frozen Yogurt – Frozen yogurt is made of a mixture of yogurt, milk, and cream. The term “frozen yogurt” is not regulated so there is not a standard for how much yogurt is actually in frozen yogurt. Italian style Gelato – A dense ice cream generally made with more milk than cream (making it lower in fat), egg yolks, sugar or other sweeteners and flavourings. Gelato has a more intense flavour than traditional ice cream, and less air. Sherbet – Originating in the Middle East, sherbet or sherbert, is a frozen dessert made with milk (or cream) and flavoured usually with fruit juice, egg white or gelatin is sometimes added. Lactose Free Ice Cream – Made with added lactase enzyme contains no detectable lactose, making it more easily digestible for people with lactose intolerance. Dairy Free Vegan Ice Cream – Ice cream made with one or more of the following ingredients (instead of milk): coconut, almond, cashew, sesame, etc. Delicious! Sorbet – Also dairy free, sorbet technically is not ice cream. It is made with fruit and sugar only.